How old is Australia’s Navy? This might seem a simple question, but over the years the Australian Navy’s birthday has remained a source of some confusion. The date now accepted is 1 March 1901. The previously accepted date of 10 July 1911 is not the birth date of naval forces in Australia, rather it was the date that the Sovereign granted the title ‘Royal Australian Navy’. As with other forces institutions the name has changed over the last 101 years, but for the Navy the date of 1 March 1901 marks the creation of Australia’s Navy. This is made inviolable by the fact that by 1911 Australia had already possessed a unified naval force for more than a decade, as proclaimed in the Australian Constitution. The legal basis for the creation of the Navy comes from Section 51 of the Constitution, which gave Parliament the power to make laws with respect to the naval and military defence of the Commonwealth. At Federation the Governor-General became Commander-in-Chief, and on 1 March 1901 the states transferred their naval and military forces and everyone employed in their connection to the Federal Government. By the following year the two existing arms of Australia’s defence force were officially recognised by the titles Commonwealth Naval Forces (CNF) and Commonwealth Military Forces (CMF later Australian Military Forces). The ships inherited by the CNF from the previous state navies were tired, old and inadequate even for training, and there was little hope for early improvement. The CNF’s budgetary allocation in 1901-02 was just £67,000. By contrast, the CMF’s allocation amounted to £638,000. Despite the disparity, a dilapidated Australian Navy was not a major national concern if Britain’s Royal Navy could continue to be relied upon to provide maritime protection. Successive British naval commanders provided this reassurance, and the Commonwealth’s payment of a subsidy towards maintaining Royal Navy vessels in Australia, reinforced the idea that issues of naval policy were best left with the British Admiralty. Deep issues of maritime strategy exercised only a handful of Australian minds, but the idea of a more capable navy, locally manned, and under the Commonwealth’s executive direction, gradually gathered support. Once he became Director of Naval Forces in 1904 CAPT Creswell embarked on a program designed to breathe new life into the CNF’s operations. Despite the restricted budget he brought several of the gunboats and torpedo boats back into commission and renewed regular training exercises to improve combat readiness. The greater visibility and renewed activity of the CNF proved the quality of Australian naval personnel and managed to excite public interest, but the service could not long survive without the replacement of its ancient vessels. Fortunately, Creswell found an ally in the new prime minister, Alfred Deakin, who, like his Naval Director, preferred active cooperation to subsidies. In December 1907, Deakin announced that the CNF would be expanded to include a flotilla of submarines and coastal destroyers, and in February 1909 Australia’s naval representative in London requested tenders for the first three vessels, the destroyers Parramatta, Yarra, and Warrego. Cerberus ratings undertaking musket drill on Port Phillip Bay. Australian authorities intended the CNF’s destroyer flotilla take full responsibility for coastal defence. However, by the time Parramatta and Yarra arrived in local waters Australian naval policy had made an even greater advance. Finding itself hard pressed to maintain its global naval supremacy the Royal Navy decided to support a more substantial Australian contribution towards regional defence. At the 1909 Imperial Conference the Admiralty suggested that the CNF expand to include a self-contained ‘fleet unit’ based on a battle cruiser and several light cruisers. The combined package represented an ideal force structure; small enough to be managed by Australia in times of peace but, in war, capable of effective action with the Royal Navy. 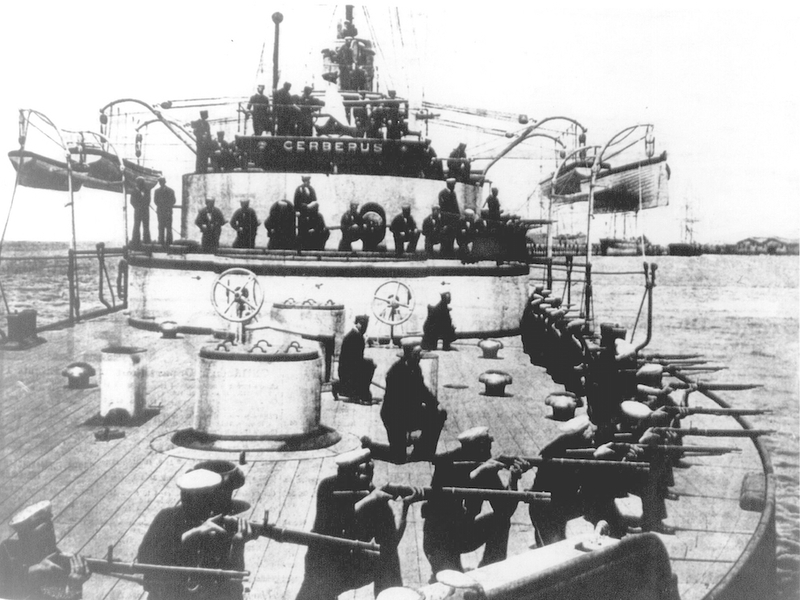 Federal Cabinet gave provisional endorsement in September 1909 and orders were made for the additional ships. 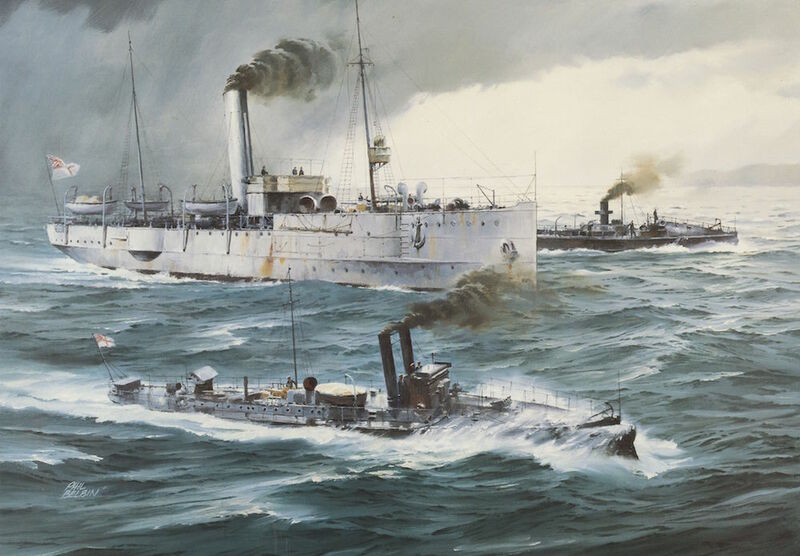 Just as important, was the passing of the Australian Naval Defence Act 1910, which provided the clear legislative authority for a navy that would no longer be limited to Australian territorial waters. Since 1904 CNF warships had been designated His Majesty’s Australian Ship (HMAS), but this had never received the King’s sanction. During their visit to London for the coronation of King George V, Australian ministers made known their desire to have the prefix ‘Royal’ attached to the Australian Navy’s title. On 10 July 1911 King George approved the request‘ with great satisfaction’. The decision was promulgated to the CNF on 5 October. Thereafter the Permanent CNF officially became the Royal Australian Navy (RAN), and the Citizen Naval Forces the Royal Australian Naval Reserve. At the stern of Australian ships, the Royal Navy’s White Ensign replaced the Australian Blue Ensign. The Australian Commonwealth flag thereafter took the place of the Union flag at the bow. The Australian Navy did not just happen in 1911, it had existed from 1901. The bestowal of the title ‘Royal’ reflected more the progress made in the previous ten years in turning a polyglot collection of obsolescent vessels into a true fighting service. Perhaps more important in hindsight, however, was that the steady revitalisation of the Navy marked Australia’s first major step towards nationhood. Arising from a deeper recognition that defence of Australia’s national interests could no longer be consigned to others, the decision to acquire a sea-going navy represented an assumption of national obligation of momentous proportion. The foresight of men like Creswell and Deakin was amply rewarded in 1914 when the German East Asiatic Squadron was decisively deterred from carrying out its plans for cruiser warfare in the Pacific. But for the navy, wartime Prime Minister WM ‘Billy’ Hughes later declared, ‘the great cities of Australia would have been reduced to ruins, coastwise shipping sunk, and communications with the outside world cut off’. One would be hard pressed to find more appropriate words to mark more than 100 years of service by Australian sailors.